Apart from being romantic, Paris is also marvelously family-oriented. Despite this, it can be tiring traveling en famille. 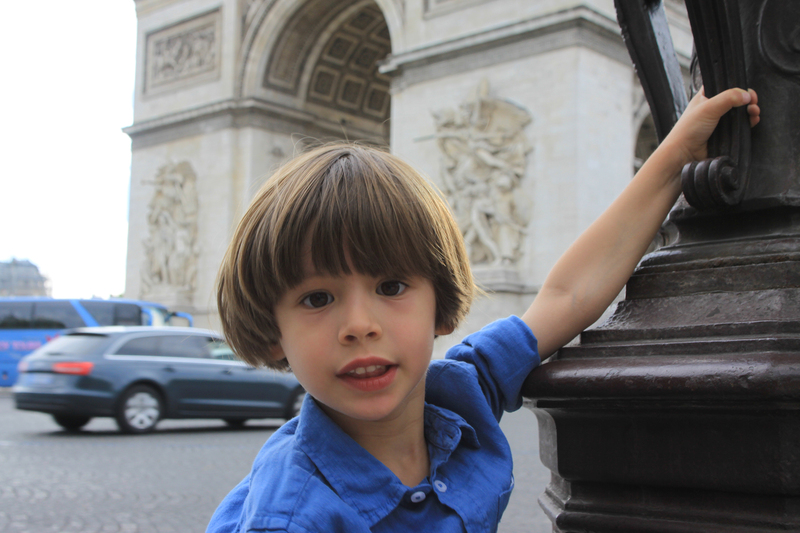 My son, Storsh, is far more tourist-tolerant if he knows some “kid time” is just around the corner. So instead of making the whole day about the kids, why not plan your days with several bursts of kid-time in between what you want to see? I’ll even give Storsh a few city facts, explaining that I’m going to quiz him on them before his next “kid-time,” and watch his ears perk up a bit. Here are some of my favorite kid-friendly activities, all of which are free or cost less than 5€. What’s better than free fun? Smack dab in the middle of town is the gorgeous Palais Royal, with Daniel Buren’s stripy stumps that any Parisian kid has raced through. Or there’s always the forest of columns at either end of the enclosed gardens, once Cardinal Richelieu’s residence, where my family and I play a quick game of hide-and-seek when passing through. Make the outside of the Louvre your playground (before making the inside their treasure hunting ground with a THATLou!). The Louvre’s fountains have wonderful iron fish faces and countless soaring lights, so have the kids count how many they can find across the Cour Napoleon, the courtyard with I.M. Pei’s pyramid, whilst sharing the story of how it housed dynasties of French monarchs before becoming a museum in 1793 under Napoleon. The stunning Cour Carrée, the center of the Sully Wing, is also a go-to for hide-and-seek. The slanted place facing Paris’ modern art museum, the Centre Georges Pompidou, has been a magnet for street entertainers since built in the 70s by architects Rogers & Piano. 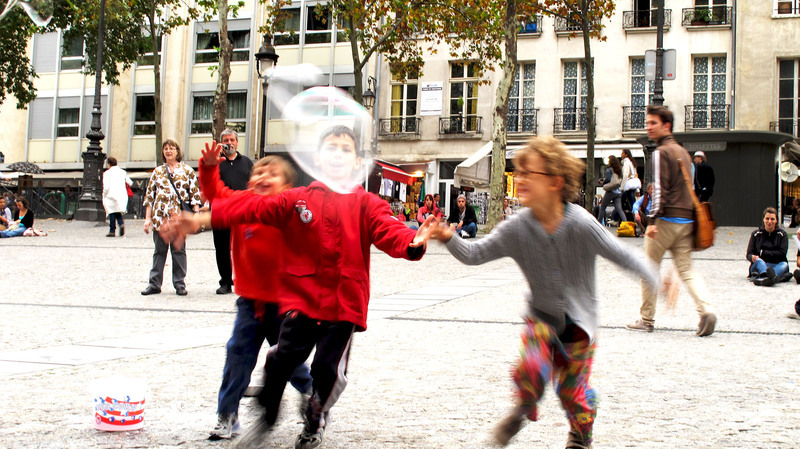 Let the kids run free as you sit alongside Parisians taking in the inside-out architectural façade. 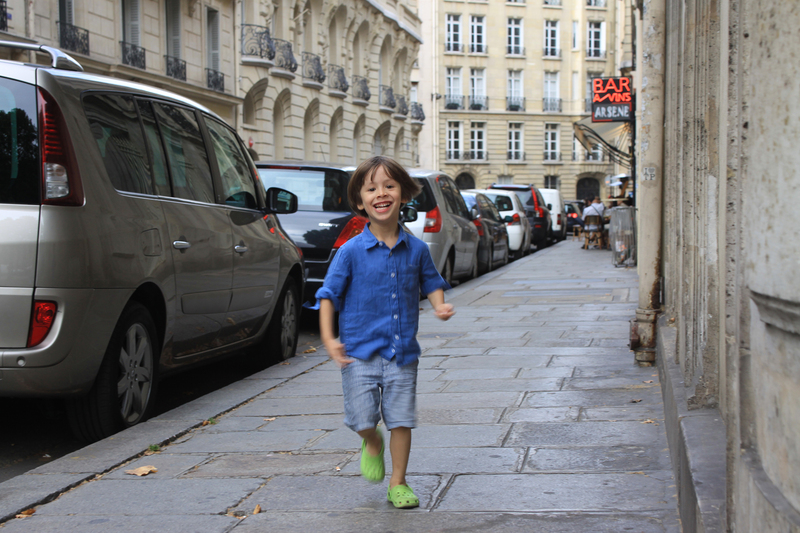 Pigeon- and bubble-chasing is Storsh’s favorite Pompidou activity, but there are also buskers, mimes, and jugglers who’ve kept him entertained for long stretches. Incidentally, the Pompidou also has the best atelier des enfants on the lobby’s raised mezzanine, as well as phenomenal views from the top floor, though they aren’t under 5 euros. 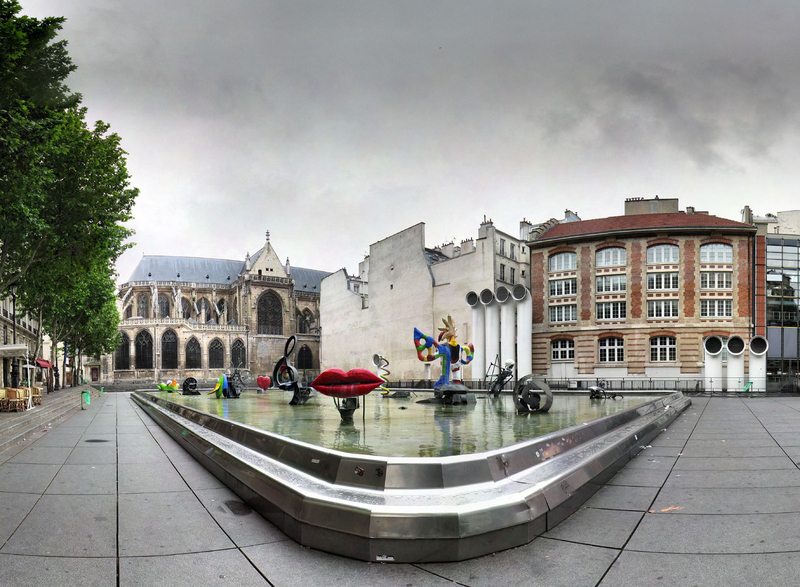 While in the area, don’t miss the whimsical Stravinsky Fountain by Swiss partners Tinguely and de Saint Phalle, where each family member can choose their favorite creature and pose for a photo impersonating these swiveling, water-spouting figures. If your children are happy to sit still for half and hour and zone out (or tune in!) to some lovely free classical music, there are a few wonderful options in the area. The neighboring 17th-century Church of Saint-Merry has an afternoon series every other Sunday at 5:30pm and the 16th-century Saint-Roch (296 rue St-Honoré) also has a free classical music series on Tuesdays (12:30-1:45pm). If your children are music-oriented (and you’re willing to dish out more than 5 euros), Jean Nouvel’s Philharmonie de Paris offers a weekend kiddie music program. One of Storsh’s favorite activities– and probably any boy of a certain age whose favorite word in English is “gross”– is window gazing at any one of the city’s fascinating taxidermy shops. Deyrolle, located on rue du Bac, is the most famous. Another gorgeous option, often with a stuffed polar bear (which does make me wonder), is Design et Nature in the 2nd arrondissement. But if you want to get authentic – especially if your kids saw the film Ratatouille – there’s also the gruesomely gross Julien Aurouze pest control shop, whose storefront is filled with dangling dead rats in all sorts of contraption traps; its perfectly aged façade reads “Destruction des Animaux Nuisibles” (Destruction of Harmful Animals). There are carrousels all across town, but I recommend heading to the oldest in Paris, designed by Opéra architect Charles Garnier and located in the Jardin du Luxembourg. Another 19th-century number, which is especially fancy, is the double-decker carrousel – the largest in Paris – at Hôtel de Ville. Alternately, you can find more modern rides, like those at the Villiers metro station near Parc Monceau, or artier carrousels, like the one located near Gare Montparnasse, where Impressionist paintings by Monet, Renoir, and Manet lining the center panels. Finally, for scaled-down versions in practical locations, there are also plenty of siren-ringing, traffic-shaking firetrucks or motorcycles that rattle around most covered markets and run one euro/ride. 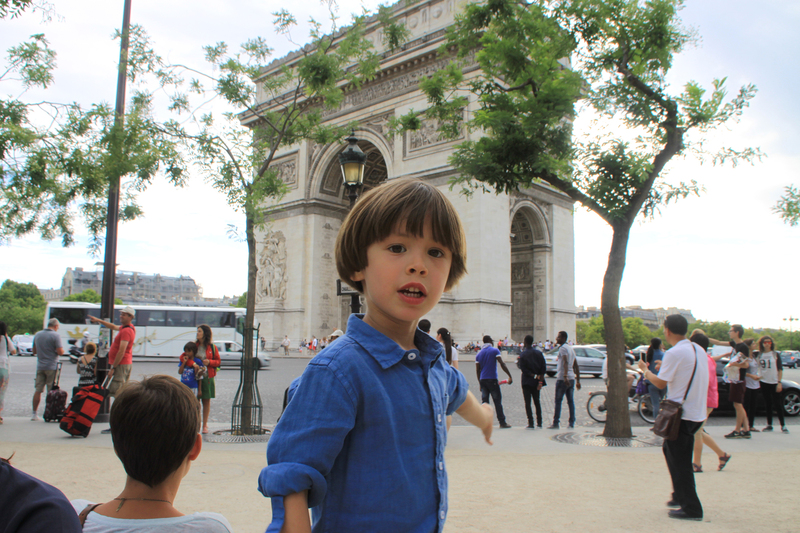 Need tips for where to eat with kids in Paris? Have a look at this useful guide from Paige Bradley Frost. The Jardin du Luxembourg is a great kid-friendly zone. Discover all that it has to offer here. 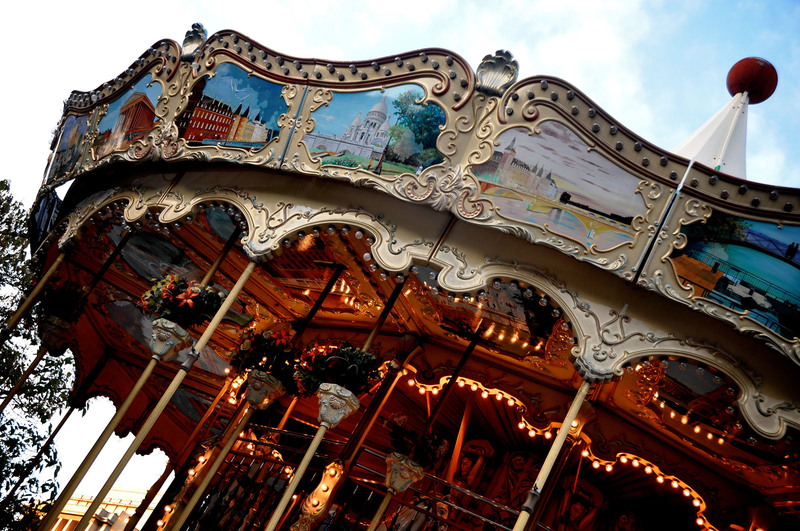 For more kid-friendly activities in Paris, check out this article from The New York Times. Written by Daisy de Plume for the HiP Paris Blog. Looking for a fabulous vacation rental in Paris, Provence, or Tuscany? Check out Haven in Paris. So lovely to see all the silliness that Storsh and I have gotten up to here. Thanks for posting!